"CLAYTON, Mo. – As new students wandered onto the campus of Concordia Seminary (St Louis - MH) last September, they were joined by another group of theological rookies — mostly midcareer types — joining the school's program that allows students to train for the ministry online. As the consultants, electricians, farmers and entrepreneurs in the Specific Ministry Pastor Program met up before reconnecting online from hundreds or thousands of miles away in the coming weeks, one student's story truly rocked. 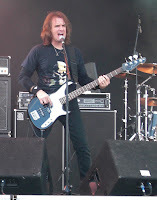 David Ellefson was an honest-to-God founding member of the legendary thrash metal band Megadeth...by the time Ellefson was 25, the rock star lifestyle had caught up to him. In a 12-step recovery program, he was reintroduced to his faith and embraced it. He moved to Arizona, married and had children. He eventually landed at Shepherd of the Desert Lutheran Church, a Lutheran Church-Missouri Synod congregation in Scottsdale. 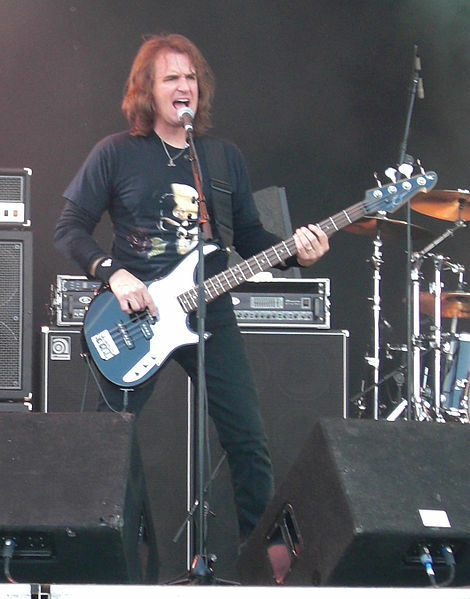 "I came from a good family, not a broken home," said Ellefson, 47. "That became a model for me, and I saw church at (the) center of it." Courtesy Religion News Service. Read the whole thing here. Just for the record, I have no idea who Megadeth were/are (I spent the '80s listening to Beatles and Byrds albums, and these days the "heaviest" music on my turntable is probably Bach's fugues), but nevertheless I found this story interesting, not least because Ellefson's story will give many of the older generation hope that their wayward adult children might return to practicing the faith one day (another post on that topic coming up). God bless your studies, David! Well, he might say something like "he who through faith is righteous shall live", Lucian. The 12 Step Program is very interesting in that just looking at it on a purely human, psychological level, it harnesses a person's faith - however they define it- in the service of their personal redemption and reformation. Makes perfect sense from a Lutheran perspective. My reader Joel in Ga posted this comment but it came through on another post, so I've pasted it here as well. :"Interesting story. I've passed it along to a Christian friend who likes that genre. In decades past, I used to listen to quite a bit of heavy metal. It was of a piece with my interest in theology. Heavy topics, life and death issues addressed, a contrast to superficial pop music that is of a piece with today's contemporary Christian music." Hey Joel, you're in Georgia, I happen to like the Allman Brothers Band quite a lot, mainly their old stuff. A 12 Step programme does not advocate any particular understanding of God. That's a good thing. Christ founded the church, not a 12 Step fellowship, to proclaim his Gospel and serve his gifts. In a 12 Step programme, one works with one's own understanding of God, as that is or may evolve. It is not there to save one's soul, but one's arse. Nice way of putting it, Terry. Of course, I wasn't for a moment suggesting that the 12 Step Program was salvific, only that it recognised the importance of faith as a motivating principle. Then again, when a right-believing person engages in the program, who's to say it isn't salvific? Assuming they import orthoidox theology into it, of course. thanks for moving the post to the right place! And I commend you on your good taste in music! "Blue Sky" is my favorite. Welcome to the old manse!